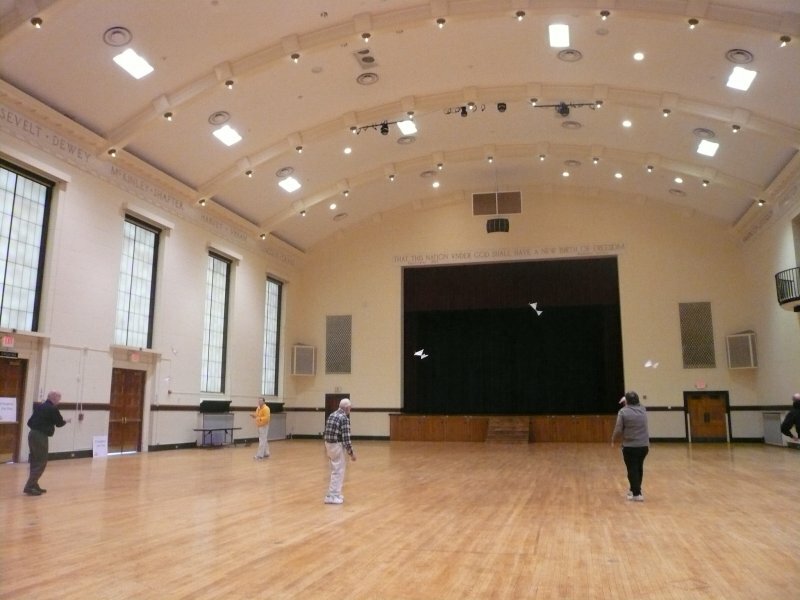 The Bong Eagles has monthly Indoor flying sessions at Racine Memorial Hall from October through April on the first Wednesday of each month. 3-11PM. Cost for adults is $15. Children fly free with paying adult. Located ~9 miles east of I-94 in downtown Racine, WI, Racine Memorial Hall is a very clean CatII site, 43′ to the peak. We fly everything from Delta darts, gliders, scale models, Limited Penny Plane, all the way up to F1D. We encourage spectators. Bring your kids, we’ll do our best to keep them entertained! $15 to fly? Wow. Would like to fly with you but $15 to fly, + $15 in gas makes for a $30 flying session for me. Tom, we’d love to have you come fly with us. The cost of Memorial Hall to rent is $160 per session. We haven’t broken even in a couple of years, often losing $100 per session due to lack of people coming to fly. This is the same price we have asked for years now. If we dropped the price, I don’t think more would come. The club isn’t flush and cannot lose money on indoor forever. The only other option is to stop having indoor sessions altogether. Thank you to you and Jeff for doing such a great job on the continued efforts to keep this site available to the Bong Eagles. Both you and Jeff are a great asset to the club. I wish the Bong Eagle the best on it’s future and potential growth. I have moved from Illinois and currently reside in Colorado. Again, i wish the Bong Eagles Free Flight Club the very best. Thank you very much for the wonderful memories of flying at Racine! Racine Memorial Hall is one of the nicest sites I have ever flown at and the Bong Eagles Free Flight club are the best bunch of free flighters around. If you can’t afford to support this club…. stay home…. more room for the rest of us. Hope you guys are still flying, I’d like to head up there. Flew with you guys a few times many years ago and really enjoyed myself. There really is a problem with the economics. You know and I know there is not a large enough amount of people interested in Indoor Free Flight to cover the costs of getting into for example Racing Memorial Hall. So, the costs for anybody interested is going to be high. Gee Tim, thanks for such a positive thought. I’m sure that kind of thinking doesn’t help bring more people to participate. I used to love flying Indoor FF, but because of its expense, I do choose to stay home. So have a great flying session Tim, by yourself. I live 85 miles away, that means gas alone is going to cost $15, add a fast food lunch, I’m looking at $40 per flying session. It just doesn’t make any sense. I hope some day we will fly together. Maybe if I feel spend crazy, I might join you. If I had to predict what will happen in the future, Indoor FF will only be a memory. Sigh. I really would like to fly Indoor FF. I was welcomed and mentored by experts, and had a priceless experience. I don’t have a lot of spare cash, but I’ll be back for sure ! Hi, a few friends and I are interested in flying on the April 4th date. Who should we pay and when? You can always pay onsite.